Paris Hilton (L) and Chris Zylka are engaged. Paris Hilton is off the market. The former reality television star and hotel heiress announced her engagement to beau Chris Zylka during a ski trip in Aspen, Colorado. Hilton's rep confirmed the engagement to E! News Tuesday--the same day she spoke to People about how the proposal occurred. "I am so excited to be engaged to the love of my life and my best friend. I have never felt so happy, safe and loved," Hilton said. "He is perfect for me in every way and showed me that fairy tales really do exist." "Paris is the most beautiful and incredible woman both inside and out. I feel like the luckiest man in the world to be marrying my dream girl," Zylka, perhaps best known for starring in the HBO hit "The Leftovers," told the magazine. "I can't wait to spend the rest of our lives together." Hilton described her ring as "gorgeous" and "sparkling." "I was shaking as I put it on," she said. "It is the most beautiful ring that I have ever seen!" Regarding Zylka's proposal, she added, "I was so excited and surprised. I immediately said yes." Hilton and Zylka met an Oscars party eight years ago, but the they didn't reconnect until 2015; the former reality star took their romance public last year. "Ever since our first date I knew there was something special about him. I have never in my life met a man so loyal, dedicated, and loving," she told People. "I knew right from the start that I wanted to be with him forever." This will be the first marriage for both stars. Hilton ended her engagement to Jason Shaw in 2003 and to Paris Latsis in 2005, while Zylka broke off his engagement to Hanna Beth in 2015. 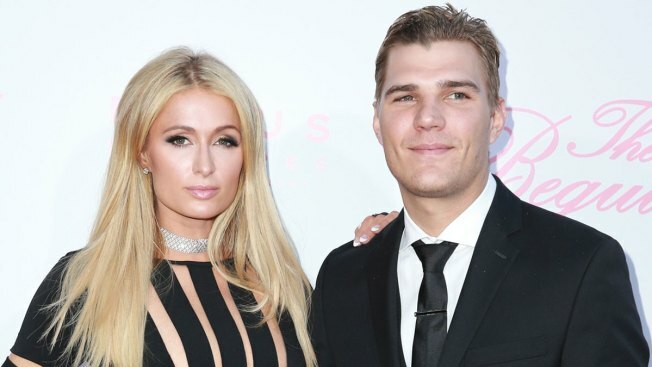 Original Post: Paris Hilton Engaged to Chris Zylka: "Fairy Tales Really Do Exist!"